Years back, Opera was the first web browsers other than Internet Explorer I ever used. The tabbed interface was the 'great' feature for me at that time. Opera introduces me about the fact that I have 'Options' as a browser. I wasted much time in playing with tabs, password remember feature, installed many themes that changed the back, forward and home buttons. It was a great browser for me and then I also find 'Mini' version of it for my Java based mobile. I was really very very happy but then somehow -I don't remember- I came across the darling, Mozilla Firefox. Mozilla Firefox also had the tabbed browsing. I don't have to open many windows for every new website I want to browse. But the Firefox was able to do more than the Opera. Apart from just tabbed interface and personalized themes, Firefox was able to add many more personal tweaks, functionality that was targeted at the productivity and get the most out of the browsing making the browser to work for me and then I fell in love with this hot and red Fox. I installed many extensions like readitlater, download manager, clearly, about: me and many many more. Also tried may 'Personas' that used to change the look of the Firefox. We had very good relationship and then a villain came to the space. The Google Chrome. My friend, to whom I recommended Firefox previously, told me to try Google Chrome. He was very much excited about it and said that 'websites open very fast in chrome'. I laughed and said that the speed is not dependent on browser, its depend on your ISP Internet speed. But then he was still impressed with the Chrome. Meantime I was completely forgotten about the Opera, though I was using the Opera Mini on my mobile. As the time passed, more and more peoples were using Google Chrome. I also downloaded and tried it for 2 days and then came back to the Firefox. Don't know why! But the main reason I think, was the extensions I was using, which were missing in Chrome. But then I heard that Chrome is releasing / updating the versions very fast and adding support for many features and then the extensions and themes were also there. 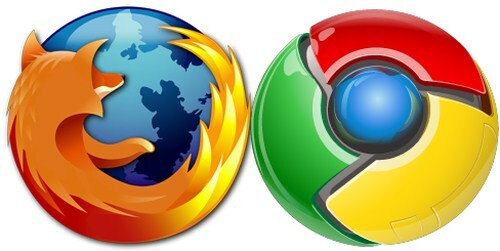 When the Firefox was not going above 4.5 versions, Chrome came and went ahead with version race. But I don't bother about just version number. But then the Google styled marketing came in. Every technology magazine, newspaper review, the TV show was screaming about how the Chrome is better than all the other browsers in the market. The blog articles like 'Chrome have every extension that you ever used in Firefox', 'Thing you can do with Chrome but not with Firefox', 'Chrome is blah blah % faster than Firefox', 'Chrome consume less memory and crash less than Firefox'. The internet has flooded with such article but then I got used to it and started ignoring such things. Such articles were a big villain in our loving relationship. I promised that I will never leave the fox alone, whatever the reason. But then the 'Power' has been always thing that you can't ignore. Google was pushing that colored round very hard. Google stopped supporting old versions of browsers for its many services. The Gmail was not working in Internet explorer and had some issues with Firefox also. But by the time Firefox was also kept releasing the timely updates and reduced the time between update cycle. It was a pleased decision. But still then Google made some services exclusive for Chrome like Google Currents. You must have a Chrome to use 'Currents'. Also there were may pages in Google AdSense forms which were not rendering well in any other browser, but the only way to use Chrome. So I started using Chrome as a secondary browser. The next step of Google was to release may features and extensions that only and exclusively work for Chrome. Just like Gmail desktop notification. The number of exclusive extensions, services, apps was increased to such an extent that I synced my Google account with Chrome and started using Google Chrome across all computers. But the 'Privacy' issue started to become hot and hotter. Though the privacy had been always at issue with Google, I never thought about it seriously, but now I had a reason. More and more I read about the issue, I was more concerned about it. Though the things Google track about me, are anonymous and as a common Internet user out of many billions in the world, I do know that my few clicks won't really matter for my privacy, but I was still thinking about it more and more. During the same time I was sharing everything on Orkut (I remember) then on Facebook, Twitter, chatting on Yahoo!, using online SMS services, using GMail chat, purchasing gadgets online, searching and saving Google search history. I was only concerned about Chrome when it comes to privacy. Don't know why but it was more the 'Hate the huge and powerful' behavior of me. And the reason for my mindset was an online blogger who was speaking about how Google is spying on every click with the Google Toolbar for all famous browsers and now the Chrome is the the spy agent in my computer. I read about many research articles those claim that even after I uninstall the Google toolbar, Google keeps track you. So I signed out of the Chrome but the compatibility and exclusive services keep me on tempting to use Chrome. Also many extensions in Chrome web store are mere shortcuts to the original website and give the feeling that the growing huge number of applications is just a number crunch. Then the famous Omnibar in Chrome suggest me to visit a website based on my browsing history saved by my Google search. Dear Chrome, Do you have any manners? Then one day I downloaded the offline installer of Chrome and double clicked it to install. There was no any response or nothing that was expected, just like every .EXE file in Windows do after I double click it to install. It asks me for some permissions, EULA, location to install and such things. My experience with this thing called Chrome was unique. I directly got the Chrome icon on desktop and on the Windows taskbar. The browser was already installed without asking me anything. I didn't understand what else has installed on my computer without my knowledge. The Google auto update services and blah blah..
Then I heard the news that, Chrome disrespect the privacy settings of Safari users. And who says Chrome crashes less? Meantime I tried the updated Opera, Safari for Windows. Opera keeps giving rendering problem with most of the websites, Safari is not for Windows and Internet Explorer is used to download other browsers. But the question is, should I betray Firefox? These days Firefox is fast and uses very low memory. I don't see why anybody would want to change ... unless you are a fan of tracking cookies and behavioral advertising. Opera works fine for me. But FF is better than CHROME.